Pharmaceutical analysis determines the purity, concentration, active compounds, shelf life, rate of absorption in the body, identity, stability, rate of release etc. of a drug. Testing a pharmaceutical product involves a variety of chemical, physical and microbiological analyses. It is reckoned that over GBP10 billion is spent annually in the UK alone on pharmaceutical analysis, and the analytical processes described in this book are used in industries as diverse as food, beverages, cosmetics, detergents, metals, paints, water, agrochemicals, biotechnological products and pharmaceuticals. 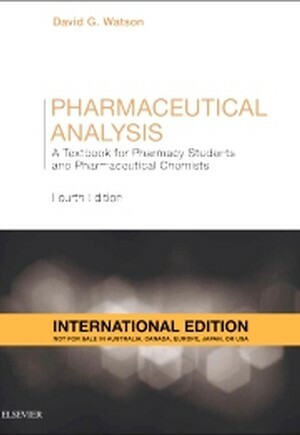 This is the key textbook in pharmaceutical analysis, now revised and updated for its fourth edition.